Bazzaz, N., Nouraee, N., Zare-Mirzaie, A., Mowla, S., Shahali, M., Vasei, M. (2018). MiR-21 Expression in Wilms’ Tumor. 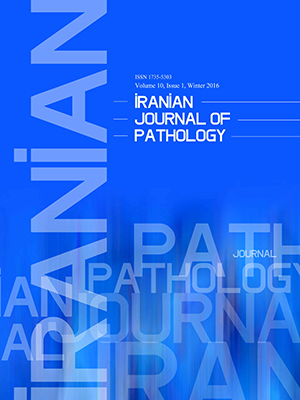 Iranian Journal of Pathology, 13(4), 422-428. Navid Bazzaz; Nazila Nouraee Nouraee; Ali Zare-Mirzaie; Seyed Javad Mowla Mowla; Maryam Shahali; Mohammad Vasei. "MiR-21 Expression in Wilms’ Tumor". Iranian Journal of Pathology, 13, 4, 2018, 422-428. Bazzaz, N., Nouraee, N., Zare-Mirzaie, A., Mowla, S., Shahali, M., Vasei, M. (2018). 'MiR-21 Expression in Wilms’ Tumor', Iranian Journal of Pathology, 13(4), pp. 422-428. Bazzaz, N., Nouraee, N., Zare-Mirzaie, A., Mowla, S., Shahali, M., Vasei, M. MiR-21 Expression in Wilms’ Tumor. Iranian Journal of Pathology, 2018; 13(4): 422-428. Background and Objective: Wilms’ tumor (WT) is the most common genitourinary tract tumor in children. MicroRNAs (miRNAs) are small non-coding RNAs; their role in the pathogenesis of many types of human cancers has been identified. We aimed to evaluate the expression of miR-21, a well-known oncomir, in WT tissue samples which is a very common urinary tract malignancy in children. Methods: We performed chromogenic in situ hybridization (CISH) to detect the sub-cellular localization of miR-21 in 25 formalin-fixed, paraffin-embedded (FFPE) samples of WT. We also evaluated miR-21 expression in 24 of these blocks and 6 normal kidneys as controls using quantitative real-time PCR technique. Results: While our real-time PCR analysis showed miR-21 significant overexpression in 4 tumors compared to the normal kidney samples, we could not detect significant ISH signal in any of these samples. Conclusion: Low expression of miR-21 in WT might pinpoint the weak involvement of this miRNA in the pathogenesis of this cancer.